There is a smell of Fall in the air. The smell of apple pies, roasted vegetables, peach crisps, and pumpkin pies baking in the oven. Something that is missing from my kitchen currently. Dearly, dearly missing. I want an oven. I take that back. I have an oven. It is in our garage. I want my oven installed. But first we need to build the cabinet that it will sit in. I need it. But in the meantime I use my mom-in-law's. Which is great. 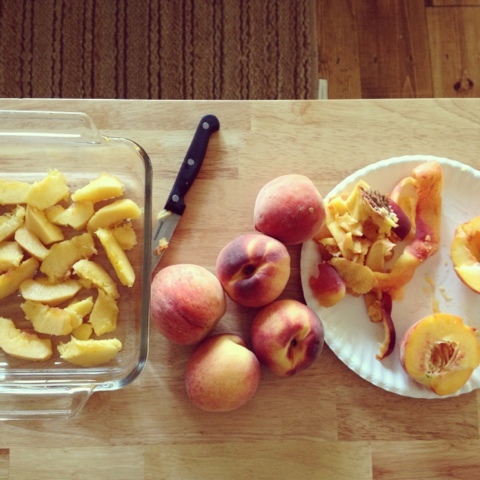 In fact that is how I recently made a delicious peach crisp. I posted a picture on Instagram while prepping it. Slice and peel about 6 peaches. Layer in the bottom of 8x8 pan. Enjoy! It is one I will be making again!